Atrial fibrillation (AF) is the most common cardiac arrhythmia and approximately 800.000 people in Germany and over 2.2. million Americans suffer from this disease. The likelihood of developing AF increases with age. Three to five percent of people over 65 have AF. Although AF is not directly lethal, it favors the formation of thromboembolism and is a major factor for the public health budget. The mechanisms leading to AF are still not completely understood. With the aid of computer models of the electrophysiology of the human atria it is possible to further understand the underlying formation mechanisms of AF, analyze the current methods of treatment (e.g. RF ablation) as well as refine these methods patient specifically. The project aims at the development of patient-specific anatomical and electrophysiological models of the atria to investigate various factors leading to or favoring AF. We established a workflow to create anatomical models from medical image data (MRI), which accounts for anatomical variants of the atria as well as realistic fiber architecture. The electrophysiology can already be adapted to various high-risk patient groups (e.g. atrial fibrillation, hemodialysis) and can further be adjusted to the individual patient based on clinical measurements. 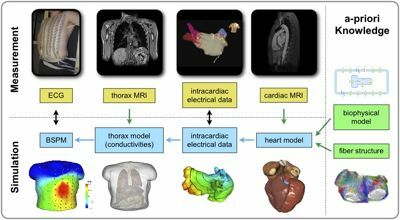 Using these techniques we were able to create a database of patient-specific cardiac and torso models (“virtual patient population”), which enables us to study the effects of electrophysiological phenomena on multiple simulation levels (from ion channel to ECG). We evaluate the quality of our models with intracardiac measurements (activation time maps) and 64+ channel ECG measurements (body surface potential maps, BSPM). We are currently developing methods for individual model-based ablation therapy planning. M. Burdumy et al. Comparing measured and simulated wave directions in the left atrium - a workflow for model personalization and validation. Biomed Tech (Berl), vol. 57(2) , pp. 79-87, 2012. M. W. Krueger et al. Alterations of Atrial Electrophysiology related to Hemodialysis Session: Insights from a Multi-Scale Computer Model. Journal of Electrocardiology, vol. 44(2) , pp. 176-183, 2011.